UNALASKA — Though the historic underwater fiber optic cable in Alaska’s Arctic Ocean was ceremonially acknowledged earlier this year, one more link awaits. And a big ship from France is on its way to finish the job, delayed by sea ice last year. In April, the Alaska congressional delegation of Rep. Don Young and Sens. Lisa Murkowksi and Dan Sullivan attended a ribbon-cutting hosted by Quintillion in Deadhorse on the North Slope celebrating 92 percent completion. Later this year, by Dec. 1, the Anchorage-based fiberoptic cable company plans to actually complete the project’s Phase 1, to bring fast internet to northern coastal communities including Barrow, Kotzebue and Nome. The data travels at the ultra-fast rate of 30 terabits per second. 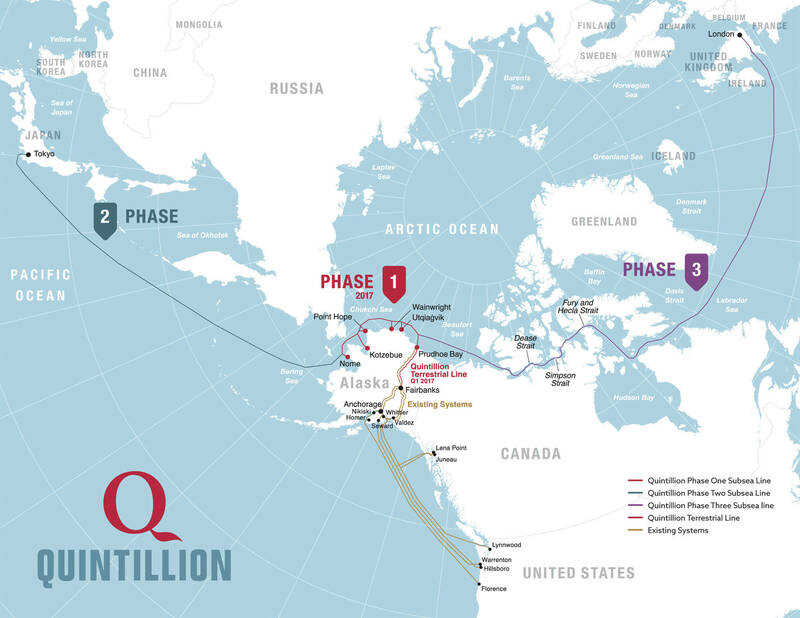 Quintillion spokesman Tim Woolston said just 8 percent of the connection to Nome remains to be completed with the laying of fiber optic cable from Point Oliktok just offshore from Prudhoe Bay to a connection 40 miles out in the Arctic Ocean. That’s where internet cable already laid on land from Fairbanks will finally connect with the round-the-horn of northern Alaska subsea cable project. Phases 2 and 3 in future years will make history as the first intercontinental cable, nearly 10,000 miles between England, North America and Japan. The final product will realize a hope for transcontinental underwater communications dating back two centuries, according to Anchorage historian Mike Dunham. “In a way it’s completing William Seward’s dream from the 1860s of connecting Alaska, Asia and Europe by telegraph line. Wait long enough and the wildest notions of the prescient can become real,” observed Dunham, the author of a recent book on Seward, a major figure in Alaska’s history as the architect of the state’s purchase from Russia. Farther south, in the Aleutian Islands, they’re still waiting for internet that’s significantly faster than a telegraph wire. Once again a big fiber optic cable-laying ship stopped over in Unalaska-Dutch Harbor for crew changes and refueling, on its way to the Arctic. And maybe, just maybe, Unalaska might get hooked up in a future year. 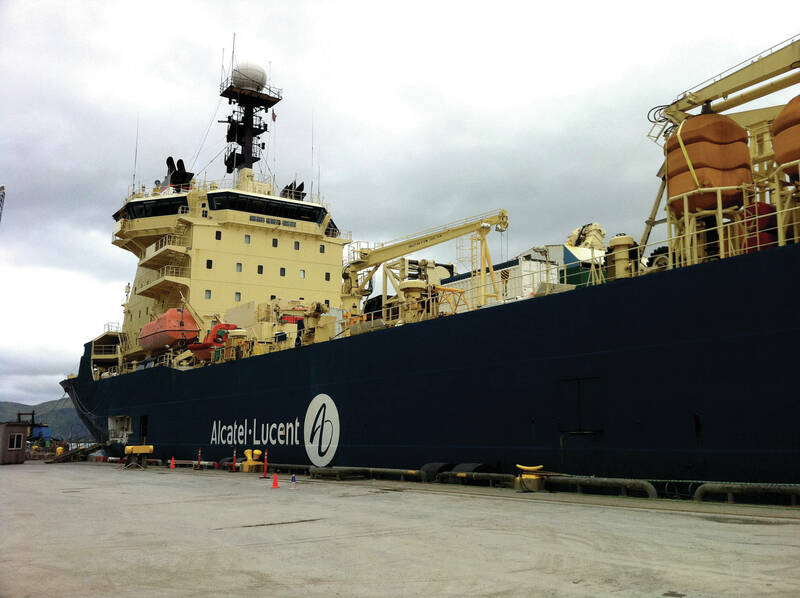 In late June, the cable ship Ile de Batz was in Unalaska operated by the French telecommunications firm Alcatel Lucent, which manufactured the cable in France. It’s the same as the two sister ships that called last year at the nation’s busiest fishing port in the Aleutian Islands. Representatives of Quintillion and its partners, Arctic Slope Regional Corp., Alaska Directional Drilling, and Alaska Communications Systems, took the vessel tour after flying 800 miles from Anchorage. Unalaska City Manager David Martinson, who has toured all three vessels, said he is “cautiously optimistic” Quintillion will bring subsea fiber optic cable to Unalaska. Quintilion is reviewing potential new sites in Alaska, and Unalaska is among them, said Quintillion Vice President for External Affairs Kristina Woolston, during the vessel tour. She said she hopes a decision will be announced later this year. The Alaska phase is just the start of Quintillion’s ambitious tri-continent cable project. The Alaska-based company next plans to lay cable east to England and west to Japan. An earlier scenario called for a spur to Seattle from the Asian route, with cable headed east from the vicinity of Attu Island. An Unalaska cable might split off from the Seattle line, directly south of the island. 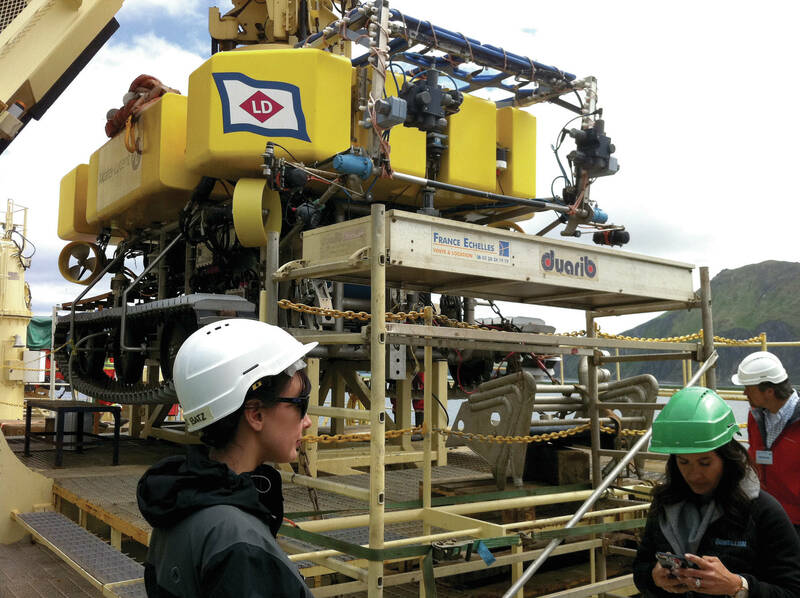 While that potential route to Unalaska would cross the depths of the Aleutian Trench, a Quintillion subsea engineer said it’s a simple matter of laying enough cable up and down the trench. Internet speeds in Unalaska are so painfully slow that the best computer code describing the agony is the old-school print media substitute for bad language, as in %#*)&@!!!! And yet there it was, like looking at something nice through a store window that you can’t afford: The solution, all wound up and ready for installation someplace else, way up north, on display in Unalaska-Dutch Harbor for two years in a row inside a huge, 400-foot-plus ship carrying miles of fiber optic cable. Martinson is determined to find a way to bring fast broadband internet service to the Aleutians, where he said last year that the speed is so slow as to prevent encryption, which enables secure electronic messaging. His goal, he said, is to connect Unalaska to Quintillion’s network, though that depends on their business plans. Quintillion CEO Elizabeth Pierce acknowledged Martinson’s interest and familiarity with the technology. “He can now give the tour on the vessel,” she quipped last year. Last summer, Quintillion laid about 1,100 miles of subsea cable from Prudhoe Bay to Barrow, Wainwright, Point Hope and Kotzebue south through the Bering Straits to Nome. On the ocean floor, a plow digs a narrow trench, which self-seals when dirt collapses over the cable. The remote-controlled plow is slowly towed from the ship at less than a mile an hour, a half knot or slower. It looks like a giant sled from a science fiction movie, about 35-feet-long and weighing 35 tons. For underwater maintenance, a tracked, remotely operated vehicle is guided by shipboard technicians monitoring screens. The proposed Asian route was an issue at the December 2015 meeting of the North Pacific Fishery Management Council, when fishing industry officials worried about trawl nets and other fishing gear snagging subsea cable in the Bering Sea. Fishing gear causes the “vast majority” of damage to underwater cable, Quintillion’s subsea cable engineer told the fishing industry representatives, adding that the burial of the cable several feet under the sea floor should keep the two industries from getting fouled up. Pierce said that in Alaska, ice scouring is a much bigger issue than fishing gear hitting the cable. The fishing industry voiced concerns at the Anchorage Hilton meeting two years ago, with advocates from the various sectors seated side-by-side at the testimony table, including Stephanie Madsen of the At-Sea Processors Association, freezer longliner representative Chad See, and Brent Paine of United Catcher Boats. Seattle fisheries attorney James Mize organized the industry presentation. A big selling point for the Arctic route is the absence of war in the peaceful region, and while Pierce said sometimes cables are damaged deliberately by sabotage, that’s more of a problem in the Middle East. Shipboard project manager Per Lundgaard led last month’s vessel tour, including a visit to the “jointing room,” where thin strands of fiber optic cable are spliced together. “I’m still amazed at what can go through a fiber,” he said marveling at the data capacity. The project, Pierce said, is destined for a television audience on the History Channel, sponsored by the producers of Modern Marvels. Last year, a videographer was onboard a cable ship for the documentary movie. Jim Paulin can be reached a [email protected].